Fresh tomatoes in the middle of the winter in a ski town? Don't discount the idea too quickly - a group of foodophiles in Jackson Hole, Wyoming are raising funds to build a three-story vertical garden to grow produce all year round. Sited on an unused parcel of city land, Vertical Harvest will grow organic produce (even tomatoes!) 365 days a year. The hydroponic vertical garden was designed by Jackson-based E/Ye Design and will not only sell produce to stores and restaurants in the area, but educate the public and employ locals with disabilities. Looks like Jackson could be a new foodie destination! 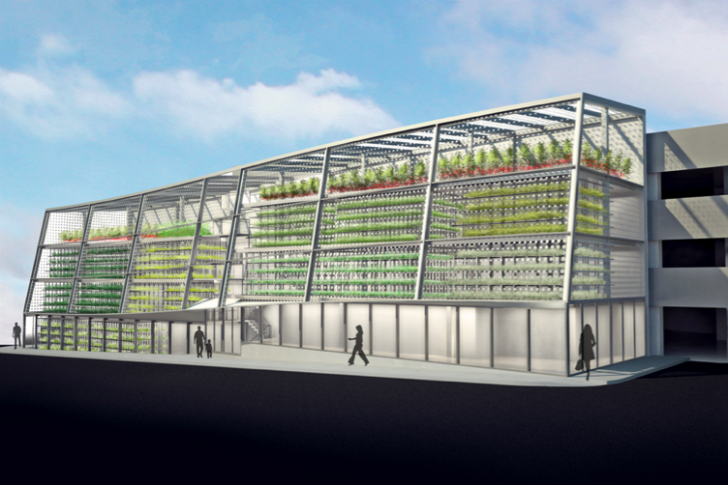 Vertical Harvest is a three-story indoor vertical garden with 12,995 sq ft of growing space. The site of the garden is located on an unused parcel of land on the south side of a parking garage in Jackson. Owned by the city, the parcel will be rented to the organization for $1 per year. E/Ye Design has come up with the plan for the garden, which will have a ground floor open to the public and two hydroponic growing floors on top. The top floor will grow tomatoes all year long and the facility will also grow a variety of other fruits and veggies. The urban garden was initiated via a project by Slow Food in the Tetons, and then separated to become its own L3C – a hybrid entity that is considered to be a ‘for profit with a nonprofit soul’. The organization will also employ and train citizens with disabilities to operate the greenhouse. Currently, Vertical Harvest is raising funds for operations and securing a grant to build the facility. Eventually, the group hopes to replicate the model in other communities around the world. We think if they can pull it off in a ski town, then they can do it anywhere. I have wanted to do this very thing and have said so for years as one of those 'if I won the Lotto' dreams. Now, it may be in my own 'backyard' and I can't be happier to see such a forward idea being realized. I want to work there since I am a gardener, landscaper and science-y geek...hope to learn there's a short timetable for it to be built and begin operations. 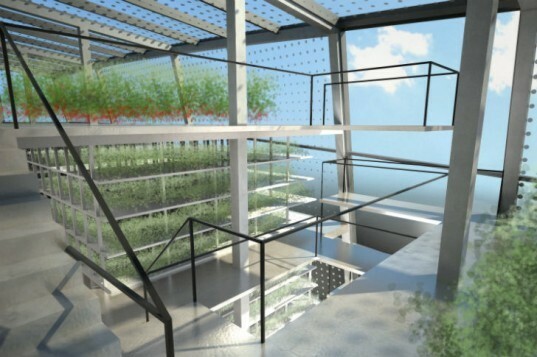 Vertical Harvest is a three-story indoor vertical garden with 12,995 sq ft of growing space. The site of the garden is located on an unused parcel of land on the south side of a parking garage in Jackson. Owned by the city, the parcel will be rented to the organization for $1 per year. E/Ye Design has come up with the plan for the garden, which will have a ground floor open to the public and two hydroponic growing floors on top. The unused parcel next to the parking garage will be the future home of the Vertical Harvest. The top floor will grow tomatoes all year long and the facility will also grow a variety of other fruits and veggies and even starts for summer gardens. The urban garden developed out of a project from Slow Food in the Tetons and separated to become its own L3C - a hybrid entity that is considered to be a ‘for profit with a nonprofit soul’. Future employees already hired to staff Vertical Harvest. Eventually, the group hopes to replicate the model in other communities around the world. If they can pull it off in a ski town, then they can do it anywhere.